Well, I got the order right at least. But that's usually the easy part. As far as the amounts go, who knew we'd see dips quite this big? I assumed we'd have a little lull the week after Thanksgiving, but falling back to mid-September numbers was a surprise. If you recall, September was a historically low month at the box office this year, seeing some of the lowest overall totals of all-time. "The Twilight Saga: Breaking Dawn Part 2" managed to hold off "Skyfall" (at least through early projections) and retain the top spot, but both films had dips of greater than 50% - in fact, no film in the top ten dropped by less than 40%, something I wasn't expecting to see with "Lincoln", "Life of Pi" and "Rise of the Guardians" still in the mix. New releases "Killing Them Softly" and "The Collection" finished about where expected, though the latter did find a way to sneak into the top ten, something I didn't think it would be able to do. Hit the jump for a full breakdown of this weekends numbers. As mentioned, taking the top spot again was "The Twilight Saga: Breaking Dawn Part 2". This was the third week for the film and the third week it's been atop the leader board. It made a projected $17.4MM this weekend, even though it again suffered a drop by more than 60%. This is very much in line with previous Twilight films, though. We probably won't be seeing a lot more of this title in the top few spots, but it shouldn't matter much as the film has already brought in more than $250MM domestically and nearly $450 internationally. That brings its worldwide total to just over $700MM in three weeks. In terms of simply its domestic gross, it's currently the fourth-highest grossing film from the Twilight series, about $50MM behind Eclipse, which holds the top spot. 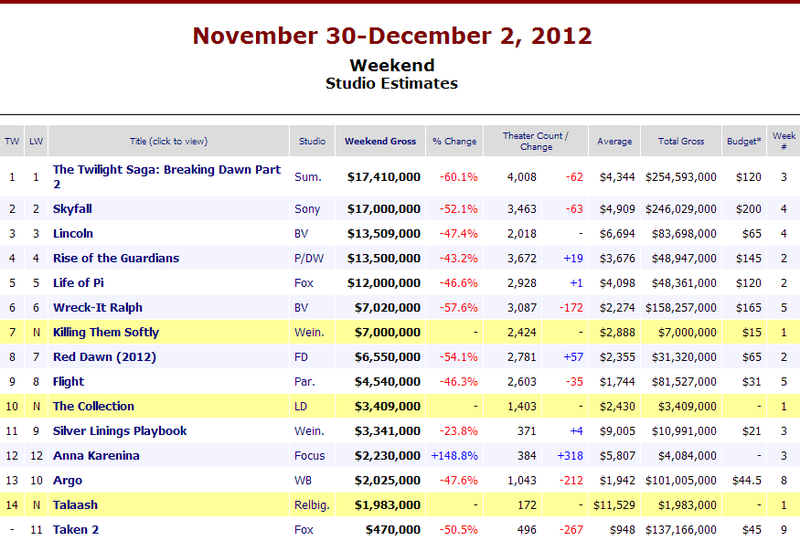 And as far as worldwide grosses go, it's currently in third, only $10MM behind Breaking Dawn Part 1 for the top spot. Needless to say, the film will surpass both of these numbers with extreme ease and become the highest grossing film of the franchise. The film has a $120MM budget that was already bested after its first weekend. Total, the series has grossed over $3.25BB worldwide, all with a collective budget of less than $400MM (five films). 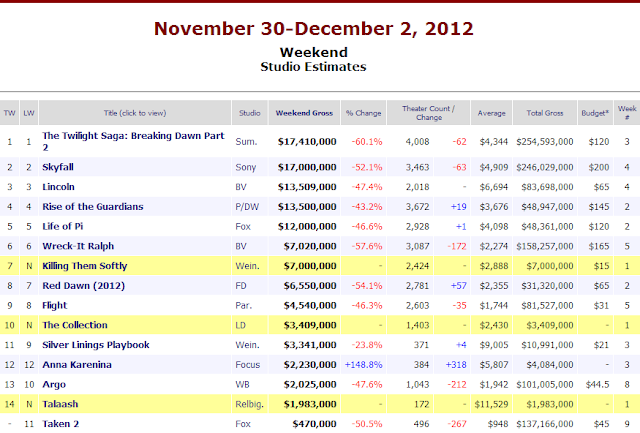 Coming in just behind Twilight was "Skyfall", in its fourth week, with $17MM. I predicted that this film would capture the top spot from Twilight, as we've seen very minimal drops per week with this film so far. This was obviously the exception though, as it dropped by more than 50% for the first time in its theater run. The film has now made just over $245MM domestically, and $620MM internationally, for a worldwide gross of about $870MM. After its opening weekend we knew none of this would ever much be a question, but as it stands, this is the highest-grossing James Bond film of all-time, both domestically and internationally. And it isn't even close. Domestically, its $246MM total is nearly $80MM above the second place film ("Quantum of Solace" - $168MM), and worldwide, its $870MM is $270MM above "Casino Royale", which held the previous record with $599MM. I'll be interested to see if this one can get to $1BB, but regardless, it's been really the first box office powerhouse of the franchise, and one that looks to have reinvigorated the series. The rest of the top five was all pretty well lumped together, with "Lincoln", "Rise of the Guardians", and "Life of Pi" claiming to remaining spots, bringing in $13.5MM, $13.5MM, and $12MM, respectively. As you can see, "Lincoln" and "Rise of the Guardians" brought in nearly identical totals this week, so we'll really have to wait until tomorrow to see how it pans out, but for now, Box Office Mojo gives the nod to "Lincoln". The film has now made $83.6MM domestically, nearly $20MM more than its budget of $65MM. And while those aren't overpowering numbers, they feel like solid gains for a political period piece. The film should be able to break the $100MM mark, even though it has (expectedly) zero presence overseas. "Rise of the Guardians" and "Life of Pi" were both in their second weeks, and their dips of 43% and 46% were the lowest of any films in the top ten. "Rise of the Guardians" has now rustled up $48.9MM domestically, while "Life of Pi" has brought in $48.3MM. Both have had similar presences overseas as well, with Guardians totaling $57MM and "Life of Pi" $60MM. For some reason or another, both of these flicks seem to be on similar paths. Guardians brings a slightly higher budget to the table ($145MM compared to $120MM, but again, it's pretty close). We'll see what happens over the coming weeks as these two try to distance themselves from each other and make a stand for the upcoming awards circuit. As far as the new releases go, "Killing Them Softly" finished in about the spot I expected it would, but with a bit less money. The $7MM opening was lower than expected considering the strong reviews the film procured. The film did manage $14MM internationally though, so at least its worldwide gross of $21MM in three days already outdoes its budget of $15MM. Even if this film can't find its audience, at least it probably won't be seen as a huge flop. The only thing people will talk about is the fact that, amongst live-action films that had wide-release openings, this is the lowest for Brad Pitt, ever. "Seven Years in Tibet" even bested it by $3MM back in 1997. But, it is what it is. I unfortunately wasn't able to see the film this weekend, so I'll reserve any major judgments until I'm able to do so. The other new release this weekend, "The Collection", did the opposite of "Killing Them Softly". It made the money I expected but landed in a spot higher than I thought. The $3.4MM it made is right on par with the $3.5MM that "The Collector" made in its opening weekend three years ago. I did not expect that $3.4MM would be enough to make the top ten, but with the low dip this weekend, obviously it was able to do so. As predicted, the reviews for the film have dropped pretty considerably since Thursday, so this will probably the last (and only) time the film gets mentioned in this post. No budget is listed for the film, so I'm not sure how this $3.4MM stacks up to that.